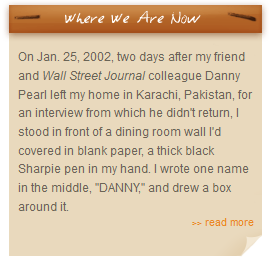 The Pearl Project is an advanced hands-on course in learning the tools and techniques of in-depth reporting. Students will follow a scientific model toward investigative reporting, working both as an individual reporter and as part of a reporting team. We will use advanced reporting methods of collecting evidence, including Freedom of Information Act requests, public records, database searches, interviewing and other techniques, to investigate the kidnapping and murder of Daniel Pearl. This course is intended to be extremely practical, while at the same time causing you to think deeply about the stories you write and why you write them. This course will show you how to do in-depth investigative reporting. You will be immersed in the practice of investigative journalism. After successfully completing this course, you should be capable of producing in-depth journalism stories. Learn strategies for gathering and analyzing information, and developing background information. You will be introduced to the research and analysis techniques of in-depth research and reporting, and investigative journalism. Gain competence in the different narration techniques used in in-depth news writing and reporting. Go beyond the day-to-day journalism done at most newspapers, magazines and broadcast outlets. Gather information by using documents and databases, by interviewing more effectively, and by getting out into the field. Use primary and secondary sources including people sources, paper sources, electronic documents and databases, both online and offline. Organize your research materials and then write a compelling story that covers not only the who, what, when and where, but also the why, the how and the "so what?" The course will combine class sessions with extensive field experience. Class sessions will include lectures and discussions of the journalistic, legal and social aspects of investigative journalism. The experiences will involve investigative reporting by individual students and by teams. Provide and explain examples of good investigative reporting. Explain and illustrate key skills and techniques appropriate to launching investigations. Provide and explain examples of good investigative skills. Provide high-level conceptual understanding of contemporary media practice. Enable students to conceptualize, research and carry out research and writing projects. Black Sites, New Yorker, August 13, 2006, by Jane Mayer. Houston, Brant, and Len Bruzzese, Steve Weinberg. The Investigative Reporter's Handbook — A Guide to Documents, Databases and Techniques. Boston: Bedford/St. Martin's, 2002. Goldstein, Norm, Ed. The AP Stylebook and Briefing on Media Law (With Internet Guide and Glossary). New York: The Associated Press, 2005. Survey Research: Alreck, Pamela L. and Robert B. Settle. The Survey Research Handbook. 3rd Ed. Chicago: McGraw-Hill/Irwin, 2004. Writing Feature Stories: Friedlander, Edward Jay and John Lee. Feature Writing for Newspapers and Magazines. 5th Ed. New York: Longman, 2004. Photojournalism: Horton, Brian. Associated Press Guide to Photojournalism - 2nd Ed. New York: McGraw-Hill, 2001. Online Journalism: Craig, Richard. Online Journalism: Reporting, Writing, and Editing for New Media. Belmont, CA: Wadsworth-Thomson Learning, 2005. Foust, James C. Principles and Practices of News for the Web. Scottsdale, AZ: Holcomb Hathaway, Publishers, 2005. Research Methods: Leedy, Paul D. Practical Research: Planning and Design. 8th Ed. Upper Saddle River, NJ: Merrill/Prentice Hall, 2005. Creswell, John W. Research Design: Qualitative & Quantitative and Mixed Methods Approaches. 2nd ed. Thousand Oaks, CA: Sage Publications, 2002. Hult, Christine A. Research and Writing Across the Curriculum. 3rd Ed. Needham Heights, MA: Allyn & Bacon Longman, 2006. Lester, James D. and James D. Lester Jr. Writing Research Papers: A Complete Guide. 11th Ed. Needham Heights, MA: Allyn & Bacon Longman, 2004. Taylor, George R. Integrating Quantitative and Qualitative Methods in Research. Lanham, MD:University Press of America, 2000. Kennedy, Shirley Duglin. Best Bet Internet: Reference and Research When You Don't Have Time to Mess Around. Chicago: American Library Association Editions, 1998. Literature Review: Hart, Chris. Doing a Literature Review: Releasing the Social Science Research Imagination. Thousand Oaks, CA: Sage Publications, 1999. Fink, Arlene. Conducting Research Literature Reviews: From Paper to the Internet. 2nd Ed. Thousand Oaks, CA: Sage Publications, 2004. Your work will be evaluated by the professors, who will measure all work according to three criteria: content, organization and mechanics. Articles and stories you submit must reach the assigned length and be typewritten. The AP Stylebook must be followed. Evaluation of your written work will be based on appropriateness of content, clarity of purpose, clear and concise writing style, efficient use of words, grammar, spelling, mechanics, organization, preparation, proper use of appropriate journalistic style, and attention to deadline. Grades for each of your assignments will be based upon a professional standard. The professors will evaluate your work according to its suitability for publication in a newspaper or magazine or on a news website whose standards correspond to the industry norm. Your semester grade will be based upon consistent effort through the semester. Meeting deadlines, growth, and understanding of the subject and techniques are of the utmost importance in this course. Attention to deadlines is extremely important. Attendance is very important. Classroom communication is a process of sharing. Your observations, insights and analyses are valuable to the whole class. Your participation will be reflected in a concrete way in your semester grade. All journalists must conduct themselves according to the highest standards of personal ethics. The Georgetown University code spells out the guidelines of the university. Excellent or A: Professional quality work. An insightful, relevant, newsworthy subject. Story involves the reader in its drama, humor, ethos or pathos. Technique is flawless with perfect content, organization and mechanics. Information supporting the story is complete and accurate. Wording is precise. The writing explores the story at different levels and does not simply make the same point from different perspectives. Publishable and distinguished. Good or B: Competent, functional story-telling. Journeyman journalism. Publishable. Clean copy that makes a significant point efficiently in support of the story. Appropriate expression of active, believable, moments that reveal a key person, place or event. Details are thorough and accurate. Writing mechanics and organizational technique are of a high order. The story is balanced. Acceptable or C: Average, run-of-the-mill story-telling. Probably publishable, but undistinguished. Properly written, but the content is average quality that may or may not be publishable. The article or story offers little insight into why the subject is newsworthy. Content is adequate to identify the subject, but poorly organized. Mechanics are good. Poor or D: Unpublishable work. A combination of flaws in conceptualizing, researching, organizing and writing render the work unsatisfactory. This is work, which with better planning and extra effort, might have been publishable. Unacceptable or F: Not publishable. Decidedly unprofessional. Weaknesses in journalistic thinking, feature writing technique, and/or professionalism have resulted in a failure on this assignment. Inaccuracies and other content errors, poor mechanics, unpublishable organization, and/or missed deadlines have reduced the assignment to failure. You will be graded on these work elements this semester — classroom assignments, a major investigative journalism work, and attendance and participation. Your final semester grade will be based on the professors' subjective evaluation of all of the work you complete and submit during the course. Attendance and enthusiastic participation form a significant portion of the semester grade. The story proposal will include exactly what information you seek to find, how you will find the information, specifically where you will find it (e.g. court documents, records, names of human sources, etc.). Major investigative piece. Your final story will unfold the results of your investigation in compelling literary and hard-hitting story form. It will explain why those results are important to your readers. The criteria for grading will include techniques, sources, thoroughness, resourcefulness and effective writing.